Before you travel to any city, there’s always one important thing that you need to consider: where you’re going to stay. 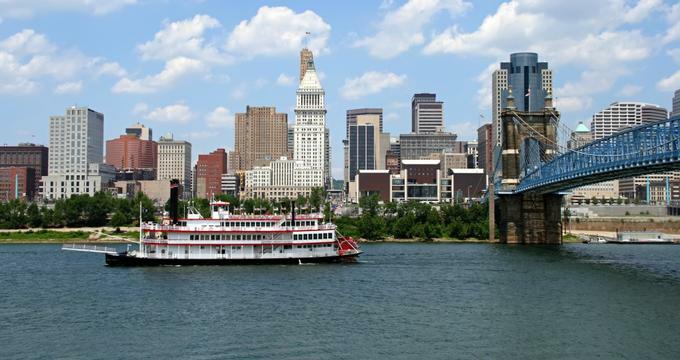 Luckily, Cincinnati, Ohio is no stranger to hospitality and has dozens of fantastic options to choose from when it comes to hotels and inns. Whether you’re looking for a swanky luxury hotel or a rustic and charming inn, this city has you covered. Not sure where to start your search? Check out our picks for Cincinnati’s top accommodations to help you plan for your upcoming or dream Cincinnati getaway. Sitting in the center of the historic Glendale area, the Glendalia Boutique Hotel offers a unique stay for history lovers and avid foodies alike. Doubling as a culinary studio, the Glendalia dates back to the 1850s, when it was once part of a railroad community and then later homes to the Proctor and Gamble families. Each suite is like a home on its own, featuring large and comfortable king or queen-sized beds, a private living room, a kitchen or kitchenette, and a lovely marble bathroom. There are even smaller touches of luxury, such as heated towel bars. Make sure to sign up for some of their gourmet cooking classes like the Everyday Gourmet, Culinary Journey, and popular Demonstration Wine Dinners classes. 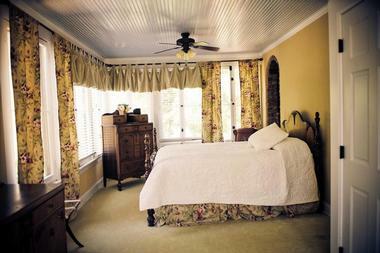 Tucked in the middle of 6 beautiful acres of land in College Hill is the Six Acres Bed and Breakfast. Just a short drive from downtown Cincinnati, this bed and breakfast features wonderfully landscaped grounds that provide visitors with a sense of inexplicable peace and serenity. Beyond a weekend vacation, the Six Acres is the perfect destination in Cincinnati for your dream rustic wedding or even a small corporate retreat. 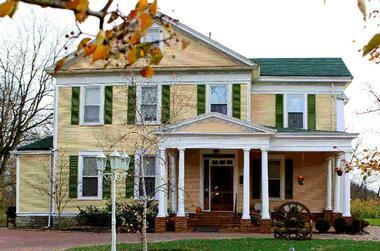 A stay at the Six Acres also provides guests with a trip back in time to the 1800s, when it was one of the homes that offered refuge to slaves escaping on the Underground Railroad. Located in Cincinnati’s bustling Central Business District, the Hilton Cincinnati Netherland Plaza is beloved by its patrons for its utter sophistication and handy location. The hotel is housed in a National Historic Landmark that dates back to 1931 and features a classy French art deco architectural style that really catches the eye. 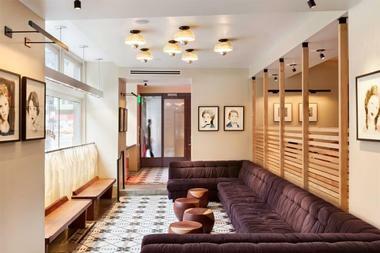 A stroll through the lobby features a lovely Brazilian rosewood paneling and magnificent ceiling murals. Of course, as with any Hilton hotel, the suites are fitted with luxurious and plush Serenity beds, complimentary high-speed internet use, flat-screen televisions, and coffeemakers. Guests are also more than welcome to enjoy facilities like the pool and a fitness center in addition to three in-house restaurants like the popular Orchids at Palm Court. 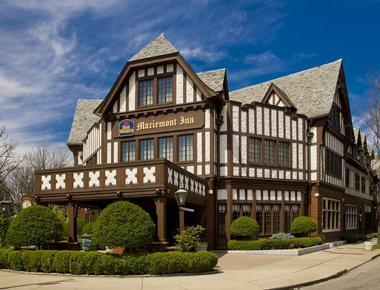 Boasting superior customer service and historical charm within an upscale boutique hotel, the Best Western Mariemont Inn is definitely worth a visit. The hotel is just a short distance from downtown Cincinnati and makes a great jump-off point for popular tourist destinations like the Paul Brown Stadium, the Great American Ballpark, and the Riverbend Music Center. Sport loving family members will love catching a Bengals or Reds game, while kids and the young at heart will have a blast at the nearby Cincinnati Zoo, Newport Aquarium, or Kings Island. 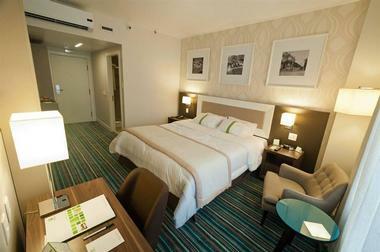 Enjoy a stay at any one of their spacious and newly renovated rooms; make your reservation today! Located in the downtown area, the 21c Museum Hotel is appropriately located right across from the Contemporary Arts Center and the Aronoff Center for the Arts. It’s known for its art collection, which features an alternating roster of 21st century artists. In fact, many guests reported feeling very little need to even step outside the hotel because of how gorgeous their collection already is. Meanwhile, the rooms are stylishly and lavishly decorated and are decked out with modern amenities like iPod docking stations, high class toiletries, and Nespresso coffee machines. 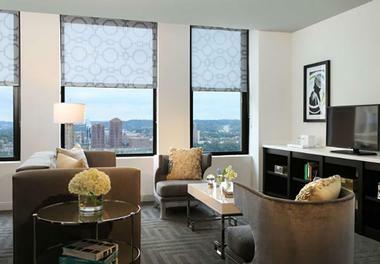 Redefine chic modernity and elevate your standard luxury at the Renaissance Cincinnati Downtown Hotel. 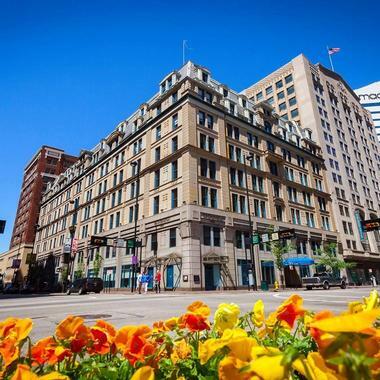 Sitting on a picture-perfect corner in downtown Cincinnati, this hotel places the city’s hottest, most illustrious, and historic attractions right at your doorstep. 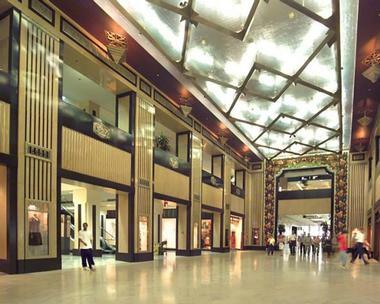 Some of the nearby attractions include the Paul Brown Stadium, the busy Horseshoe Casino, and The Banks. At the end of the day, retreat into the comforts of a plush hotel room and capitalize on lush amenities like elegant bedding, a flat-screen television as well as a coffee and tea maker. Want to squeeze in a workout? Head to their well-equipped fitness center! Meanwhile, those who fancy some great food can dine on international delights at D. Burnham’s, the hotel’s popular restaurant. People all over the world love staying at the Holiday Inn. This is no different in Cincinnati with the Holiday Inn at Downtown Cincinnati. Guest rooms at the Holiday Inn meet the high standard of excellence set by the brand, with their modern and contemporary rooms fitted with either a king-sized bed or two queen-sized beds and covered with triple-sheeted bedding. Each suite is also fitted with the comforts you would find at any great home, like high-speed internet, an outstanding flat-panel HDTV, a refrigerator and microwave as well as a rather large work desk and an ergonomic chair to match. 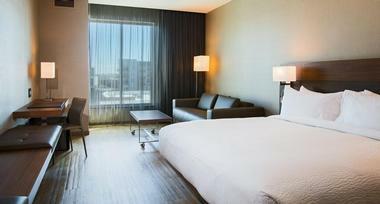 A proud member of the celebrated Marriot chain of restaurants, the AC Hotel is perfectly located by the Liberty Center. This spacious hotel offers boutique rooms that ooze style and sophistication while providing top amenities indicative of world-class service. Work out at the hotel’s very own fitness center or start your day with a dip at their indoor heated pool. Hungry? Head to the AC Kitchen to savor delicious American dishes at the hotel’s signature restaurant or head to one of the nearby restaurants that promise fantastic local fare to tickle your taste buds. Looking to stay in a place that feels like home? Look no further than Elysian Place LLC. 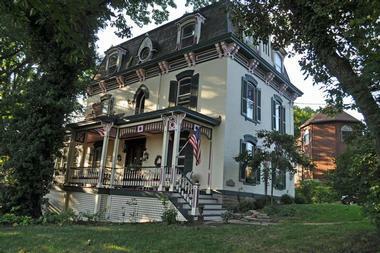 This quaint, cozy, and charming home is owned by Jan and Chip, who have been living here for over 30 years. Having raised four children in the home and retired from their woodworking business, the couple decided to open up their home to visitors, much to the delight of many past and recurring patrons. The home itself is one of the oldest in Cincinnati’s Clifton Heights area and features an enchanting solarium, a beautiful dining room, and a relaxing front porch from which to enjoy a view of the city. Let’s not forget the living room, which features custom cherry woodwork, the play area, which has ample room for your kids to roam and play, and the patio, which offers tranquility for those who seek seclusion.